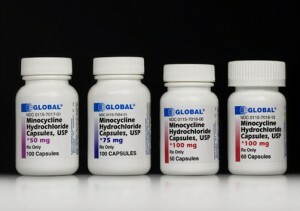 Some of the common side effects of Minocycline are dizziness, vomiting, mouth sores, vertigo, ataxia, yellowing of the skin, and discoloration or staining of the teeth or gums. It is most often used in cases where bacteria in the prostrate and brain needs to be attacked. For the most part, Minocycline side effects are mild and rarely affect patients in major ways. Temporary teeth discoloration or staining is commonly observed in young children and adults taking Minocycline. A Vitamin C supplement may be recommended by your doctor to counter this. In some cases, an extreme reaction to Minocycline can occur. If you display any of the following symptoms, be sure to contact a health care professional immediately. Side effects may include, in some cases, bringing out autoimmune hepatitis and irritating systematic lupus erythermatosus. It can also cause a very rare condition known as secondary intracranial hypertension, which may induce some of the listed symptoms of Minocycline side effects like dizziness and vomiting. The absorption of Minocycline can become impaired if the patient is taking iron or calcium supplements at the same time. Serious effects of the drug can include sudden changes in mental health. Depersonalization is chief among these. The effect of depersonalization is the feeling of floating outside the body, watching from the outside as you go about your daily tasks. Those who suffer from depersonalization have described it as if they were floating “in a dream,” and were “strangely disconnected from reality.” It can lead to other personality disorders such as obsessive compulsive disorder, borderline personality disorder, bipolar disorder, depression, and insomnia. In addition to this, if taken very long period of time, Minocycline can cause thyroid cancer. It is important to engage in regular thyroid testing if you will be taking Minocycline for a prolonged period. A health care provider should treat any adverse side effects of minocycline as soon as possible. Do not take Minocycline if you are trying to prevent pregnancy, as it can interfere with the effectiveness of birth control pills. Minocycline may also irritate yeast infections in women. Because it is a basic antibiotic, it is often prescribed to older men and women when dealing with bacteria-induced illnesses like pneumonia, which is a common illness that befalls the elderly. While not entirely substantial, it has been suggested that Minocycline can cause cardiac arrest in elderly patients. It should not be taken with alcohol or coupled with Penicillin. Minocycline should also always be consumed with food. Minocycline should only be taken under the supervision of a health care professional. Patients should be aware of the medication that they are taking while consuming Minocycline. They should also inform their doctors of any underlying medical conditions or allergies before using this drug.